Tag Archives for " susan g komen "
I teamed up with the wonderful Bling my Bra folks, an eBay charity to support the Susan G. Komen Foundation, to create and donate a signed bra made of duct tape. The bra, which also includes my two best selling books, Duct Tape Marketing and The Referral Engine, is being auctioned this week by way of eBay. I hope you can step up and support this important cause. I cannot vouch for the comfort of this bra as they would not allow me to model it for the photos! 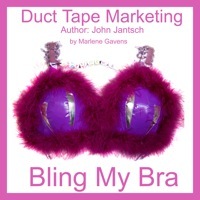 The artistic inspiration and creation of the duct tape bra, adorned in purple boa feathers was that of Marlene Gavens of The Savvy Seller. Here’s the eBay auction page – please consider bidding and supporting this important cause.